--- The first outfit marked "Mechanics Made Easy" (1902) cost 7 shillings 6 pence. 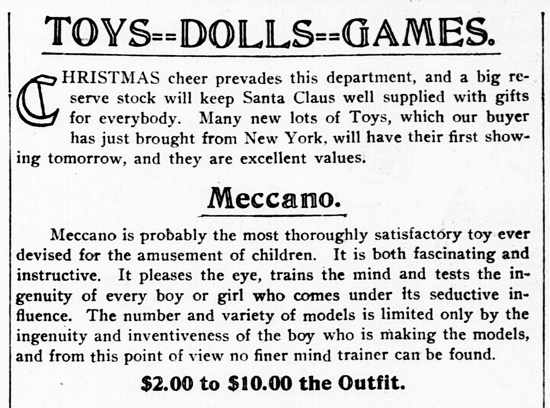 --- The first outfit trademarked "Meccano" (1908) cost 4 pence. 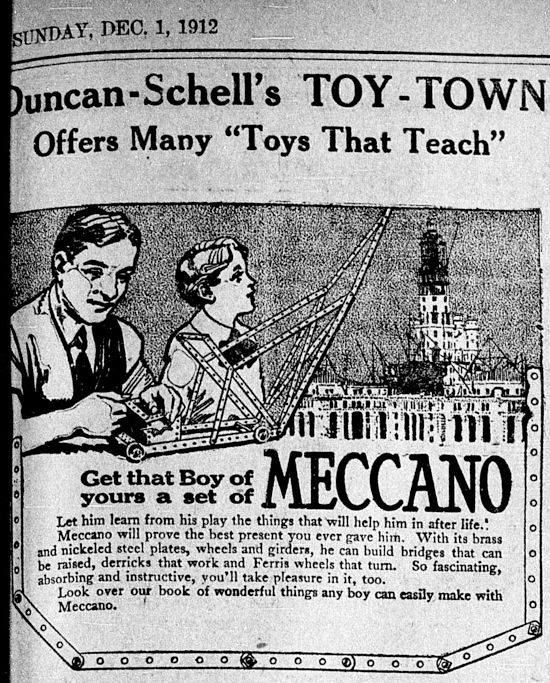 Features: In early newspaper advertisements, Meccano - born in 1901 under the name "Mechanics Made Easy" - was described as «a patent adaptable mechanical toy, with which boys may exercise they ingenuity in constructing cranes, bridges, wagons, shafting, etc. - in fact, an endless variety of models. The metal strips being perforated with holes, equidistant, enables them to be formed into the shapes (among others) enumerated». The first sets had a very limited range of parts, manufactured by various local firms, and the strips were made from thin tinplate steel with edges folded over to give strength. The boxes were long, thin, and attractively tin-printed. By 1904 the outfits included girders and gear wheels, three different sets were product, accessory outfits and manuals were introduced. 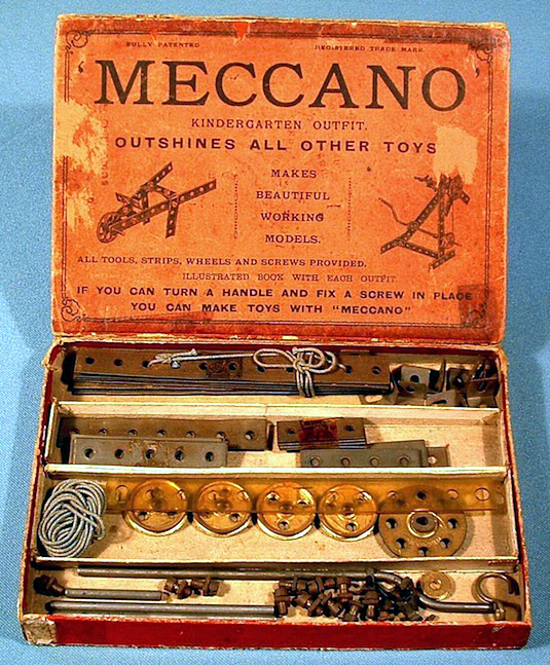 In 1907, after a temporarily rebrand as "Simplified Mechanics", the very first "Meccano" trademark appeared on a new large box called "Meccano Kindergarten Outfit" (though, the design of the parts remained the same). 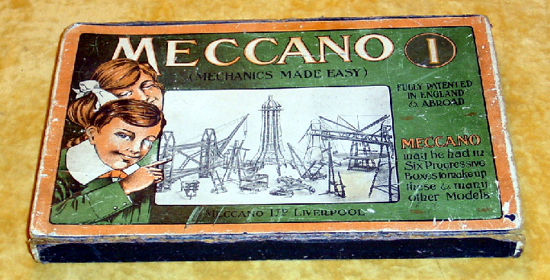 Since then, "Meccano" became the official name, with "Mechanics Made Easy" in brackets as subtitle for 3/4 years and then cut off. In 1908 the boxes were large, the outfits were numbered from 1 to 6, and the parts were nickel plated. Through the years new designs, parts, and outfits were developed using different materials and technologies, for an always-modern toy. 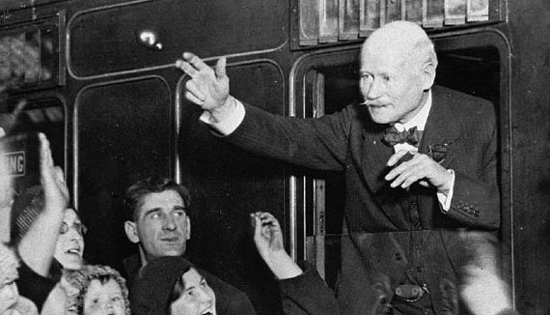 Interesting facts: In 1898 Frank Hornby, a bookkeeper from Liverpool, began to design a system of interchangeable metal strips, plates, wheels, axles and gears, with nuts and bolts to connect the pieces, for the amusement of his two children. 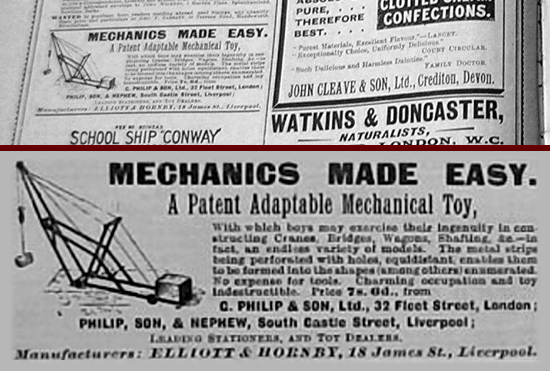 Supported by his employer David Elliott, Hornby got his new system patented in 1901, and started selling it as "Mechanics Made Easy" outfits, with parts produced by external businesses in Liverpool. From 1902 to 1907, advertisements began to appear in newspapers and magazines, model-building competitions were also advertised, new parts and sets were introduced, and with the support by chair of Engineering Henry Selby Hele-Shaw sales started to take off. In 1907 Hornby decided to rebrand his sets: the iconic "Meccano" trademark was registered, and sets carrying the new name made their first appearance. 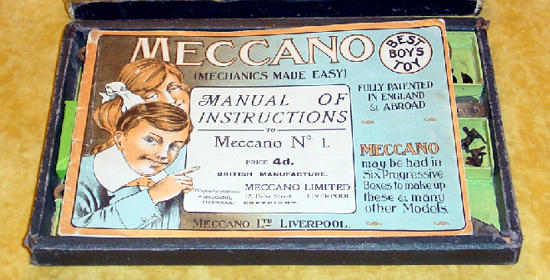 In the same year the first factory opened on Duke Street in Liverpool, and Meccano began to be exported to many countries, but it was not until 1908 that the new "Meccano Ltd." company came into being, when Hornby bought out his employer's stake in the business (until then the sets carried the monogram "E&H" or "Elliot and Hornby"). At the same time, the outfits evolved with the introduction of the nickel plating. In 1914 a large factory was built in Binns Road to churn out the new Meccano sets in increasing quantities, and in 1916 "Meccano Magazine" - edited by Frank Hornby and published by his Meccano Ltd. company - was launched to keep Guild clubs informed of each other's activities, as well as encourage the sales. 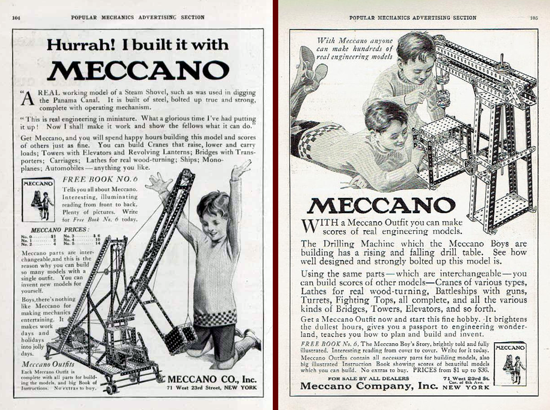 For over 100 years, Meccano has inspired countless engineers, designers, architects and creative minds of all ages. Property: Meccano Ltd. - Spin Master Ltd. 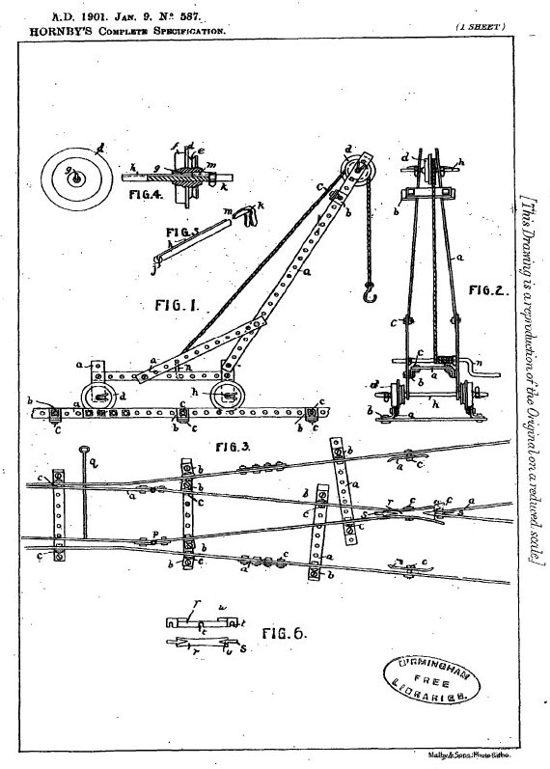 Mechanics Made Easy, precursor to Meccano, patent (January 9, 1901, accepted Nov. 30) by Frank Hornby for "Improvements in Toy or Educational Devices for Children and Young People". Mechanics Made Easy, crane (1904). 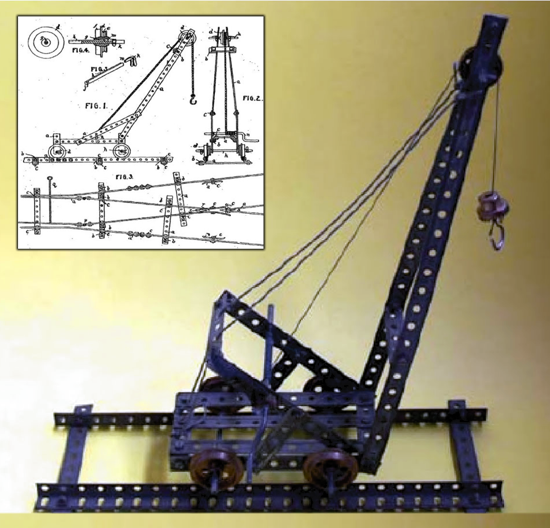 This model, similar to the example in Hornby's patent, is made with Mechanics Made Easy first outfit. Meccano Kindergarten Outfit, the very first outfit trademarked "Meccano" (late 1907). Produced for Christmas 1907 and sold until 1910, this outfit encouraged children to draw out simple models with a plastic ruler on squared paper in a drawing book before construction. 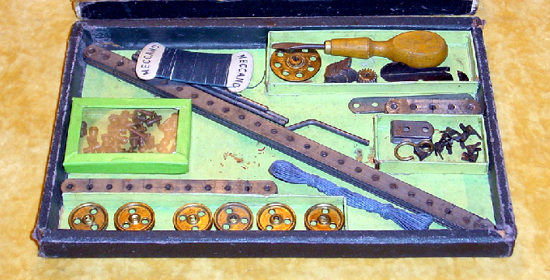 Meccano first outfit (1908). Nickel plated parts are introduced, and the "Mechanics Made Easy" subtitle on the box will soon be cut off. 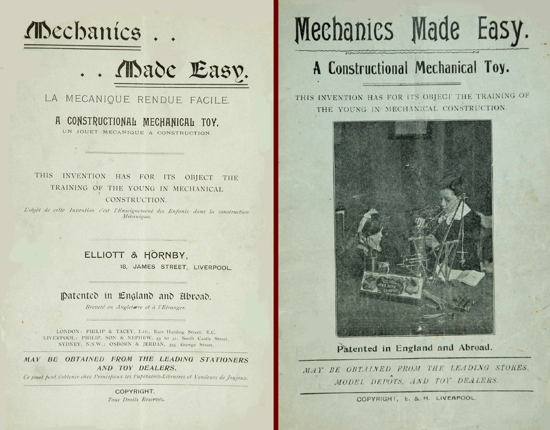 Meccano Magazine, first issue (Sept. 1916, left) and last (Apr. 1981, right). 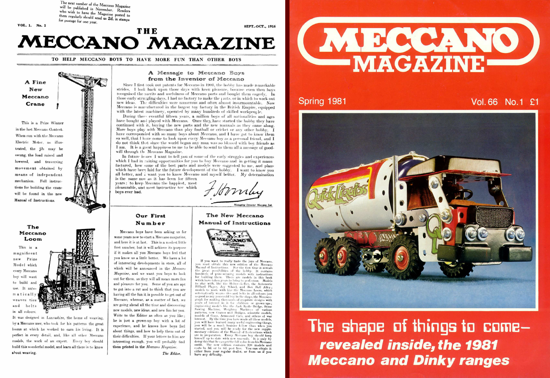 Meccano Magazine was launched «to help Meccano Boys to have more fun than other boys» by inventor Frank Hornby (first editor), and published as bi-monthly by his company Meccano Ltd.
Frank Hornby (Liverpool, May 15, 1863 - Maghull, September 21, 1936), the inventor, businessman and politician who invented Meccano toys and founded Meccano Ltd.
Meccano 100th Anniversary (1901-2001, left), and Frank Hornby 150th Anniversary (1863-2013, right). 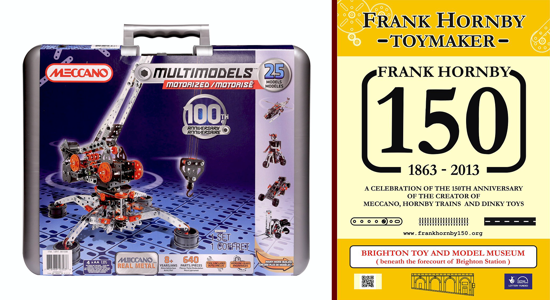 In 2001 Spin Master Corp., brand owner, launched a special Anniversary Edition to commemorate 100 years from the Meccano patent. In 2013 museums, communities and enthusiasts from all over the world celebrated 150 years of the inventor (poster by Brighton Toy and Model Museum).